Sebastian Schneider and Florian Kallus form Kaschkasch. On behalf of Zeitraum Kaschkasch has taken the “Rail” single table and de-veloped it into a variable furniture system that cuts just as fine a figure in the home as it does in me as the office. Thomas Wagner talked to Florian Kallus and Sebastian Schneider about it. Kaschkasch – the name echoes the French word “cache-cache”, meaning hide-and-seek. It refers to designers Florian Kallus und Sebastian Schneider. The two men met while studying product design in Münster. 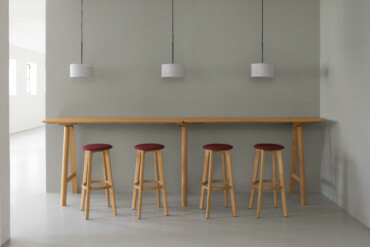 Since 2011, when they set up their own studio, they have numbered among the most interesting newcomers in furniture design. Their designs stand out for the clear lines, precise functions and surprising details. We met the designer duo in their studio, a former saddlery and stable in Cologne’s Zollstock district to talk about the new “Rail” table system they developed for Zeitraum, and which first went public at the 2016 Orgatec. The slightly different office: “Rail” connects the pleasant with the useful, and cuts as fine a figure in an apartment as it does in a studio or office. Thomas Wagner: What is so special about your new table system for Zeitraum? Florian Kallus: There are several special aspects about the product. For one thing, it is a new office concept. 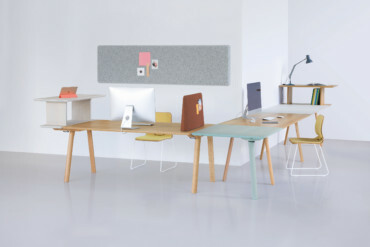 Together with Zeitraum we tried to introduce the idea of solid wood into the office. 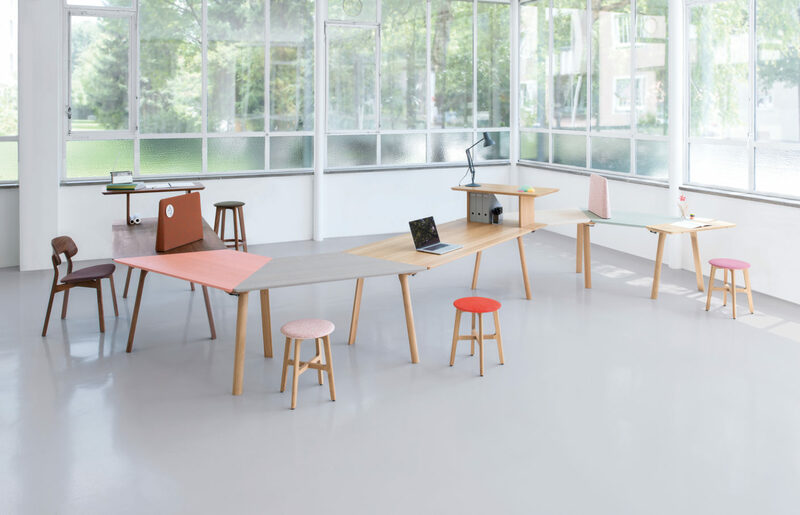 We simultaneously set out to develop the approach systematically, rather than seeing the connection between office and office furniture so strictly. 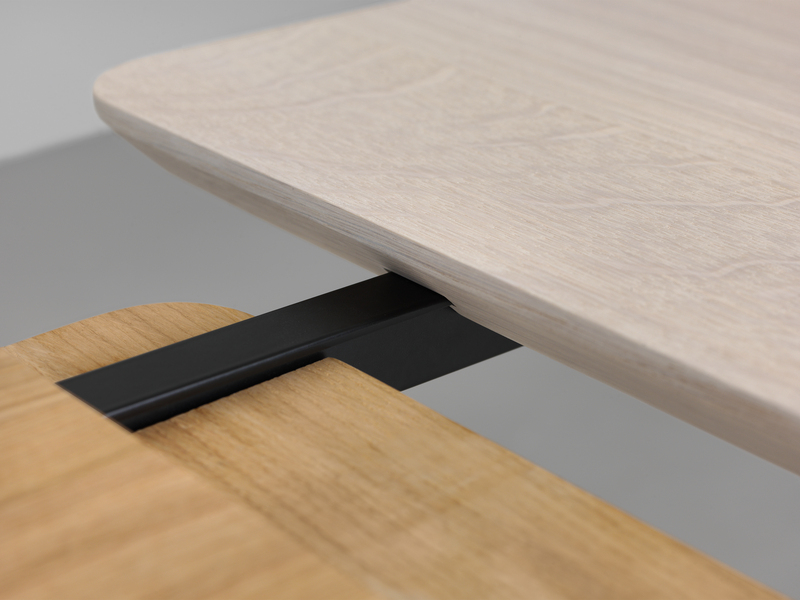 We took our “Rail” table as the starting point – with its specially developed T-Move profile. This metal profile now forms the central theme for the new system. 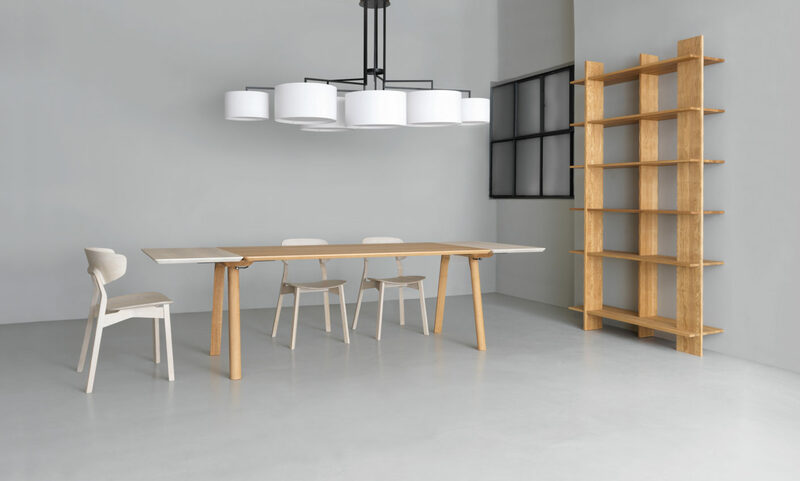 But unlike an individual table this one cannot only be extended, as in addition various elements can be attached to it – such as a cross-shaped top or a 60° trapezoidal top. This means it’s possible to form a wiggly line, say, in a large room. We configure the system in such a way that in principle it can be extended in all directions, in other words not only in length but also in height and width. No matter what the finished combination is like, at the points where the tops meet only one trestle is needed to join them to each other. You don’t get two sets of table legs. And whether you are assembling or dismantling your table configuration it takes next to no time: Loosen the tensioning lever, insert a top, fasten the tension lever again – that’s it! In other words, in principle, “Rail” offers unlimited options? Florian Kallus: Precisely. In a home setting you can configure a large table in a very short space of time. And things are no different for an office or conference area. 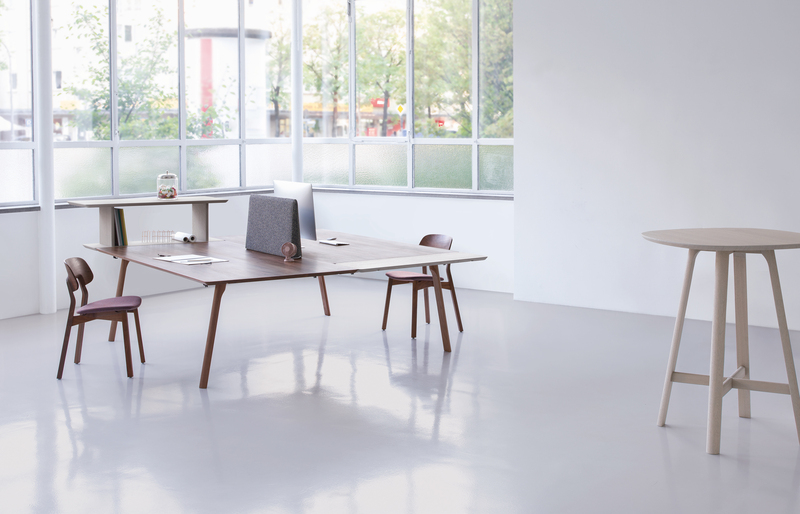 There are also various high-desk versions with the same-sized top as a normal table. This means you can even assemble complete counters. Put differently, you bridge the gap between office and other applications? Florian Kallus: That is correct. But it also works the other way around from a dining table to an office item? Sebastian Schneider: Yes, that’s right. The concept includes both. It is in keeping with current trends to be able to convert a product used in a home setting to all manner of other areas. After all, an office has long ceased to be just an office – with melamine-coated white tops and so on. 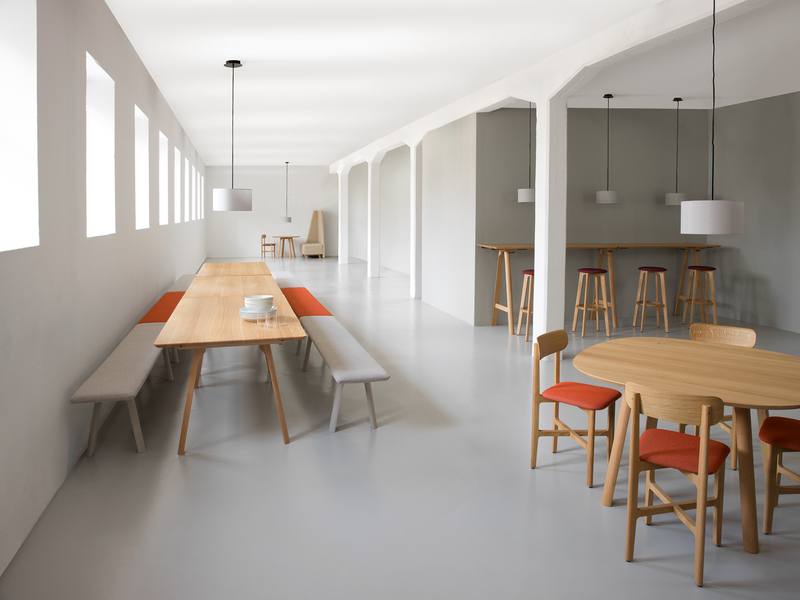 Starting point – the dining room: By means of “Rail” you can opt for a set of single tables or a table system. In other words, you don’t want to decide definitely where you would most prefer to see the system – in an office or somewhere else? Florian Kallus: That’s the idea. It is not that easy to create a product that is multi-purpose. What we’ve tried to do is to design a table that thanks to its light, studio-like appearance works well in a home setting, but by dint of its expanded functions and the fact that it can be installed in rows can be utilized in the contract world as a conference table, and in the office as a desk. Then we approached Zeitraum with our idea, because we knew they would be the ones who could realize it in excellent quality. After all, it’s not the first product that you have designed for Zeitraum. Sebastian Schneider: No, we not only made the “Rail” single table for Zeitraum, but also this small wardrobe “Hide & Park”. In other words, we had already worked together. What prompted the decision to expand the “Rail” concept into a system for Zeitraum is the fact that Zeitraum has often successfully collaborated with architects, and has a good reputation in the contract market – but still has unrealized ideas in the table segment. 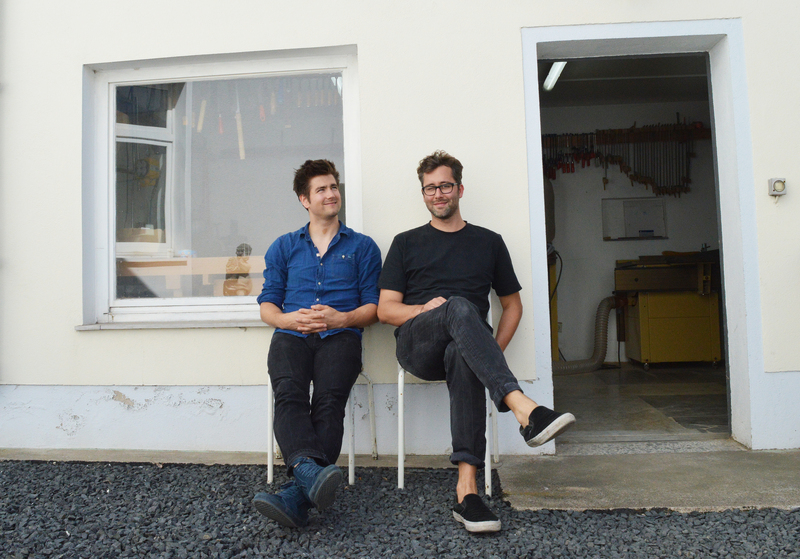 Many an idea originates here: Florian Kallus (on the l.) and Sebastian Schneider in their studio. The system really is very versatile. What details do you find particularly attractive? Florian Kallus: ... given the radii on the edges you automatically get gaps, which are ideal for accommodating cables in offices. Moreover, in order to be able to work standing up without a separate higher table, we have developed a special module for standing briefly, to work say on a laptop, or look for something in a folder. ... which can simply be installed on the table wherever you need them? Florian Kallus: Yes, this makes it easy to distinguish between various different work areas. They absorb noises, deaden the sounds from a neighboring colleague, and can also be used as pin-boards. Did you have such a comprehensive system in mind from the very outset? Sebastian Schneider: Yes, and no. To begin with, the main focus was on versatility. But gradually we added other elements to it. For example, the bistro table was not part of the initial concept – neither as a dining table nor as a standing table. It was not until later that we designed these variants, once we realized that sooner or later people would ask for them anyway. Very variable in terms of length, height and width: Kaschkasch’s new “Rail” system for Zeitraum. Did you ever think of designing a kind of “Eiermann frame” for additional and sophisticated needs? Florian Kallus: (laughs) Well, that’s not exactly the comparison I would make ... our system has a different quality, a different character. But naturally, you can use an Eiermann base with a top as a dining table, no question about it. What was more important for us, though, was the transformation or transition – from home setting to office and back. That is reflected in the fact that, for example, we did not look at the standing tables in terms of its technical structure, and instead said: Okay, we won’t work with gas pressure springs, but will focus more on a look that fits into a studio environment. 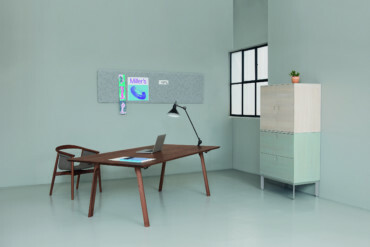 In a way “Rail” is very, very casual – you can add something here, attach something there, while the acoustic panels are simply set up where they’re needed. Sebastian Schneider: What was clear for us was that we didn’t want to simply design another highly functional piece of office furniture, but rather a flexible system with a homely character. “Rail” should appear simple and casual – you should be able to easily add something, shift something, attach something, move it, or convert it to a large table. 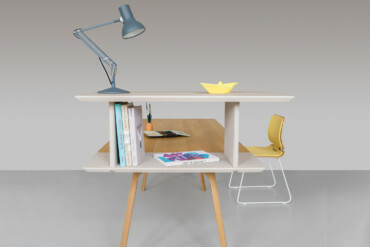 Is it not a contradiction wanting to fuse a dining table and a working table with one another? Looking at the furniture I tend to think of a dining room rather than a studio. Sebastian Schneider: That depends a great deal on the respective version. But the connection between home setting and work is intentional. Florian Kallus: Creating a certain homeliness in the office is exactly what we wanted. In other words, a home studio that you also work in? Sebastian Schneider: Other constellations are also possible. It could also be a large office. There is a basic trend in the office sector to reintroduce the feeling of homeliness to the workplace – as regards the materials, too. If we talk about a studio, what is meant is that the furniture comes across more casually than usual – more relaxed and playful. Why shouldn’t an employee who at present only sits at a desk also be able to work standing up, or have a different colored table-top tomorrow? Assemble just as long as you like: colors, materials and shapes abound with “Rail”. You evidently like things that can be altered easily. What is the reason for that? Sebastian Schneider: Have you noticed that in several of our products? 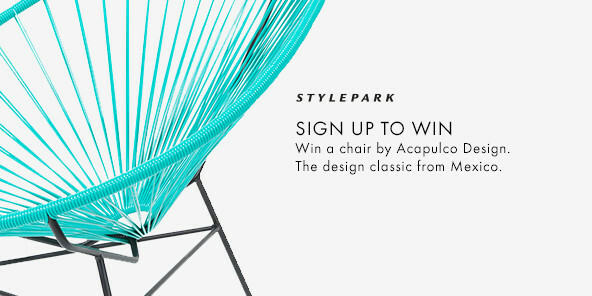 Naturally, especially in “Rail”, but also in furniture like your foldable writing desk or the movable coat rack. Mobility and the system concept – do they have to do with experiences of your generation? Should everything be flexible today – us included? Sebastian Schneider: There is nothing wrong about being able to change something. Fitted furniture is designed once, and after 20 years you have to throw everything out and replace it. We were fascinated by the idea of devising an entire furniture family and then developing a family of tables that can be used for many applications. Then we tried to find clever solutions for the various details. But don’t you find it fascinating achieving mobility and variability based on a system? Sebastian Schneider: Our first idea came from the fact that, in principle, the length of a table top is fixed – at least, when it’s made of solid wood. So we said: You can have several table-tops that abut lengthwise. And then we got the idea of placing the table leg directly under the joint, so you don’t need two sets of legs, and can add tables as needed. We were inspired by a bridge in which two concrete sections meet on a pier. We have always been interested in the principle of reduction. Florian Kallus: Then came the question: What is it like working standing up now and then? Especially, when you are working together. One person stands up, the other stays seated – that is somehow awkward. Sitting, standing, using different things, it just makes more sense and requires different postures. So you need the different levels. Acoustics always plays a role, and the question about what to do with all the cables had to be answered, too. The system is based on the purpose-developed T-Move-profile. Once the tops are linked, the tensioning lever gives you stability at the flick of a wrist. Once the technical framework had been determined, did you then think about how industrial say the tensioning lever should look? Florian Kallus: Not really. 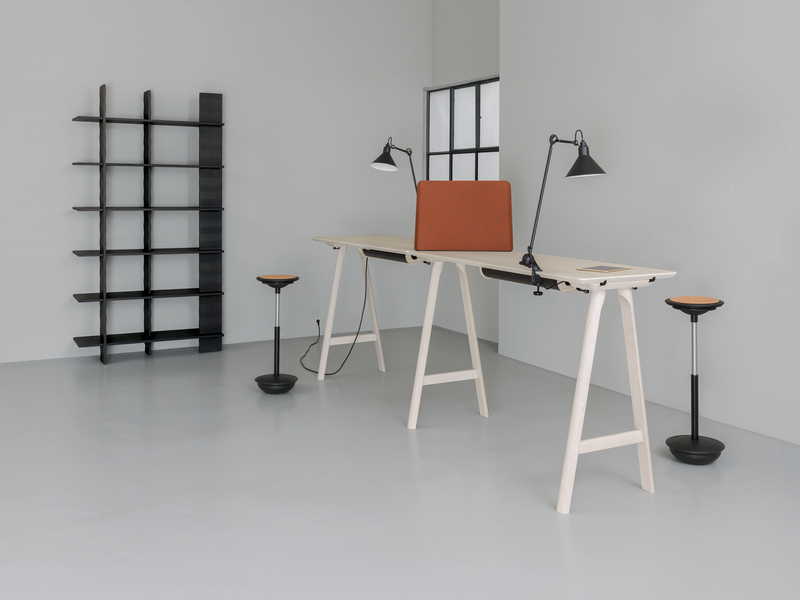 From our collaboration with Zeitraum we knew their strength lies in the perfect working of solid wood. Sebastian Schneider: We wanted to maintain the basic concept of “Rail” in its expanded version. Which is why we didn’t push the differences between individual versions for the home and office setting, but stayed with one and the same principle. It was just with colors and surfaces that we took another look at what could be done. Did any major obstacles crop up during the development phase? Florian Kallus: One I do remember was this intermediate platform you can use for working standing up. We tinkered around with that for a long time. We wanted it to work either at the end of the table top or between two table tops, and not appear too bulky. At the same time, the space between the lower and upper top should be big enough for a folder. Sebastian Schneider: But there wasn’t really a point where an important element didn’t work, and we thought it might fail because of that. The basic idea worked amazingly well from the very beginning. That surprised us, too. Was it difficult in terms of production engineering to achieve precise connections? Florian Kallus: It was like this: We had seen in the functional model that our T connection worked. And when the people from Zeitraum then said: Congratulations, that really does work, we had managed it. Sebastian Schneider: Naturally, it is not that easy when you are using solid wood for something. After all, wood is a material that never stays still. Which is why the table-tops also have stiffening to stop them from warping. And as the frame is pulled tight using the tension lever excellent rigidity is guaranteed. The system is as simple as it is functional, and can even provide you with a lectern. Do you generally start out with a tried-and-tested typology, and then try to optimize the details? Sebastian Schneider: That might not be the case in the next project. It may just be that we end up deviating from a typology. And we find that fascinating, too. 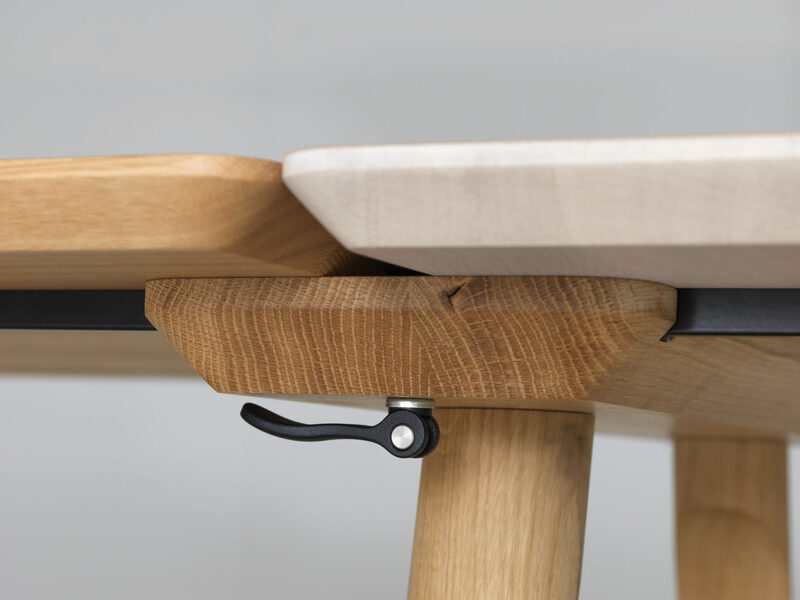 But the “Rail” table system was to be innovative as regards a specific application. I’m more interested in technical issues, Florian is more of an aesthete, and then we spend a long time discussing functions and forms… until a solution emerges that we both like. Does design also have additional aspects for you that are important for your work? Social components, sustainability, material ... Buckminster Fuller thought that designers and architects should save the world. Do you have similar ambitions? Sebastian Schneider: That would be quite a tall task to take on, but I think we will manage that. Florian Kallus: We already try to be sparing with materials. We don’t believe in material overload. If we can omit something we do. There is a certain sustainability in that. And sustainability is definitely a topic, especially when you are collaborating with Zeitraum. You often talk about function. Do you still believe that attractive forms develop from functions? Florian Kallus: Yes, I suppose so. But at the same time, I’m very open for other ideas. Moreover, in our designs the functional tends to be restricted to details, and does not define the overall appearance of the finished product. Is the “Rail” system not based on a rational logic? Florian Kallus: It is an attempt to combine logic and, if you like, poetry. Poetry? – now that does surprise me. It sounds a bit vague, doesn’t it? Florian Kallus: On the one hand, there is the logic of the system, but on the other there is something that corresponds more to emotion. Sebastian Schneider: But we don’t talk about feelings. Is it possible to define your design approach – geographically and historically? Sebastian Schneider: That is difficult to say. Florian Kallus: I find that difficult, too. On the topic of geography and design, I find it more exciting to discover how different all the people from all the different countries are with whom we collaborate, how different even the email communication is, and how much the meetings differ. You get really considerable cultural differences. Our affinity for wood is easier to explain: both of us did carpentry apprenticeships so we spent years working with the material. Okay, forget the question. We’ve been talking much too long anyhow. Sebastian Schneider: Really? And I was just warming up. Do I have time to say hallo to someone? So let me ask a final question: the things you make generally come over as being streamlined, reduced to the essentials, but never boring, rather with a touch of elegance. Would you see that as a fair description of your work? Florian Kallus: Okay, then we’ll just forget about the poetry. Sebastian Schneider: That’s fine by me too.